The Knight of Pentacles sits on a stationary draught horse, carefully looking at the gold coin held in his hand. He is in no hurry, preferring to assess and plan his path ahead before taking action. In the background, there is a broad field that has been laboriously ploughed row by row, symbolising that this Knight is ready and willing to do the work to realise his dreams, even if it is repetitive and dull. 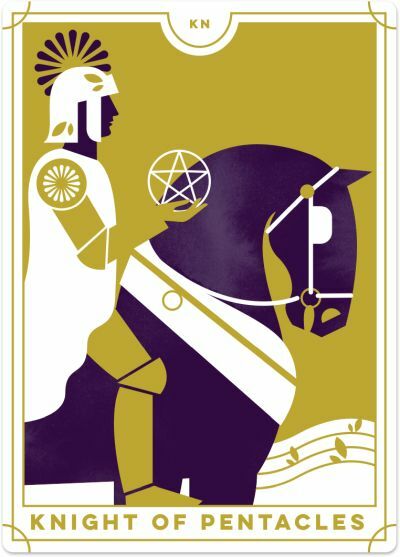 The Knight of Pentacles, like the Knights of the other suits, represents work, effort, and the responsibility that follows upon the dreams and ideals of the Page. This Knight is the most hard-working, methodical and detailed-oriented character of the Tarot deck. He may not be the most inspiring or creative Knight, but he’ll do the work to get the results he seeks, even if that work is highly repetitive or routine. 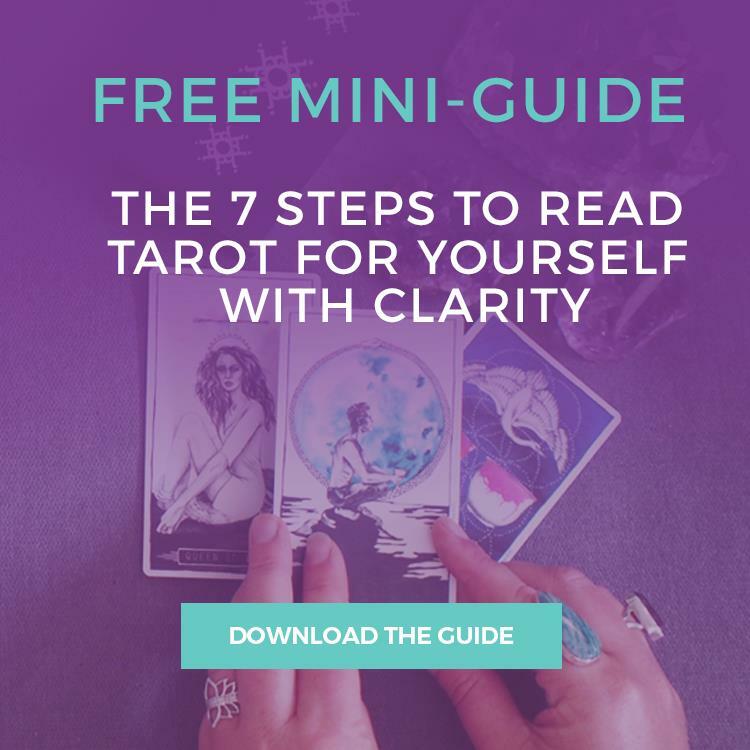 When this card appears in a Tarot reading, you are working methodically towards your goals. You have a plan in place and are sticking to your schedule to get the job done. You may not work particularly quickly, but you are consistent, dedicated and committed to your goal. Put one foot in front of the other and finish the job. This card also asks you to continue doing what you are doing, plodding along and making gradual progress. No need to change your approach. Go with the flow, stick to your usual routines, and over time, you will reach your goals. The Knight of Pentacles shows that you are a natural planner and implementer. You envision your goal, determine the best course of action, and then stick to your path with a methodical and relentless focus. When you are in ‘implementation mode’, the job will get done, even if it requires hard work along the way. Meticulous in your approach, you make sure that everything is planned and executed down to the tiniest detail. And you will never leave a job half done. It is essential to you that you complete all assigned tasks and projects to a certain standard and that you follow through on your promises. Sometimes, the Knight of Pentacles points to the more mundane or boring aspects of life – the daily grind, repetitive schedules, household chores, and other responsibilities and obligations. You may be assigned a project or given a task to do, and you will have to commit your time to see that project through to the end successfully. With the Knight of Pentacles, you will be required to accept responsibility without any complaints or grudges. The Knight of Pentacles suggests that you are taking a moderated and conservative approach to life right now, and while you may be feeling that change is imminent, you are sticking to your tried and tested ways of doing things. You have established that you need routine and careful planning if you are to achieve your goals. It may not necessarily be an exciting period, but at least you know you are on the right path. Even if you are growing tired and want to quit, this Knight invites you to keep at it, and you will eventually see success. Do you need greater self-discipline and commitment to achieve your goals? Instead of trying new things or dreaming up more ideas, the reversed Knight of Pentacles encourages you to establish a schedule or routine for yourself and stick to it until you have completed your assigned task. The reversed Knight of Pentacles may also point to a journey of self-development or improvement, in which a routine will support your success. For example, you may create a healthy eating plan or exercise schedule for yourself to help you become more fit and healthy. You may also need to pay more attention to the practical matters in your life that you have ignored recently. Mundane activities such as home upkeep, money matters, business relationships and moving forward in your career have been left by the wayside as you focus on more exciting or important opportunities. Depending on what is on your plate, you may want to make more time to get your life in order, or you may continue to focus on more pressing priorities. On the flipside, the Knight of Pentacles might also suggest that you are feeling stuck in the daily grind and life has become boring and dull. While you may have implemented a routine and schedule to increase your productivity and efficiency, you are now finding it stifling to your creativity and innovation. It may be time to do something different. Be spontaneous. You don’t always have to stick to the rules. Perhaps you have become unadventurous, overly conservative and resistant to change. You may prefer just to stay at home while others are out having fun and taking risks. There’s nothing wrong with a quiet night in; however, you may be isolating yourself from others or losing the interest of your friends. Try to get out more and be open to new experiences. The reversed Knight of Pentacles can also warn that you are becoming a perfectionist in how you approach your work. Have you caught yourself being critical of others who do not share the same attention to detail as you, or becoming quickly frustrated when their work is not at the same standard as yours? While your hard work is appreciated, you do not want to lose the support of others along the way and may need to soften your approach.